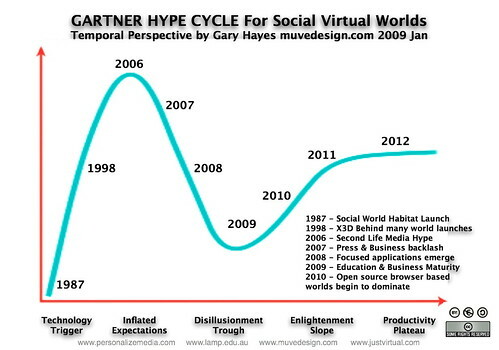 Throughout 2008 the corporate world was exposed to the reality of virtual worlds, which has seen a growing influence on how companies train, market, advertise and communicate. This is a trend that is expected to continue into 2009 as organisations begin to recognise the merits of incorporating gaming into their basket of communication tools. For those who have never played a computer game in their lives, virtual worlds look foreign, sinister, scary, and like a waste of valuable corporate resources. However, for those who grew up in a world where they played virtually, their expectation of being able to apply the consequent life lessons will be expressed in their expectations of the work environment. Computer gaming, and the associated virtual worlds, will, as a result, be seen as an increasingly important infrastructural consideration. Virtual Worlds News puts more of a realistic spin as regards raw investment (tracked over at VirtualWorldsManagement also) into new ventures with a decline (albeit way ahead of the global recession) of venture capital put into worlds – around $101m in q4 2008. In its item $101M Invested in 13 Virtual Worlds-Related Companies in Q4 2008 VWNews believes that there is a move into older generation worlds and those with much more of a niche focus. With the harsh economy looming larger than ever, it seems like more and more focus is being put on unique niches and markets, established business opportunities, and quick-to-market strategies. Virtual goods have expanded to become a $1.5 billion market, but Second Life was engineered in the days before the business model was fully proven. Linden Lab residents exchanged more than $360 million worth of virtual goods and services in 2008, making the virtual economy and the ability to make a living one of the big draws of the virtual world. Top merchants in Second Life have made more than $500,000 in real money in 2008. So there is definitely something afoot at the moment even in serious global recession there is a kind of exodus into virtual alternatives happening. The most important message is that developing on a reasonably stable and mature platform is not a big investment and companies, education departments and entertainment property owners should still see this investment as two key returns in the ‘real time, immersive arena’Â – how to create experiential services and how to engage with a community. 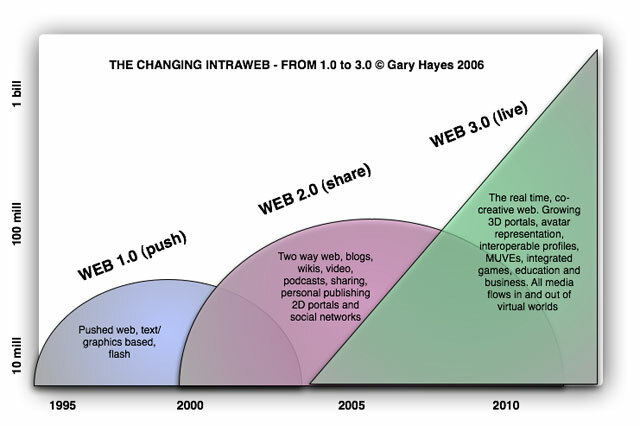 I leave you with a diagram I created nearly 3 years ago that shows a transition from web 1.0 to web 3.0 and let you decide if and how it maps onto my mapped Gartner hype curve above. Very informative article, thanks for sharing with us.